HOW WE FORESEE OUR FUTURE has a huge impact on who we are and how we view our present. Through ‘cultural futuring’, illuminart cultural producer David Ryan said, The GeriActivists program invited Seniors in St Marys, Western Sydney, to look beyond what they know, and imagine the future for their children’s children and beyond. What would the world be like in 50 years? What do they hope or fear, and what gift from the past would they give that deep future? Then the question arises, how do you express that combined vision for all to see? The answer for illuminart was through the futuristic technology of Virtual Reality, creating a totally immersive 360° experience. “It takes people on a journey – something positive and healthy and they have a sense of wellbeing afterwards,” David said. His background is in cultural education and film projects, while illuminart is best summed up by its maxim “stories in light, making people and places shine” through innovative projections and immersive media. Together with a group of GeriActivist Seniors, who David refers to as “forward-looking and tech-savvy”, they have created a new future, which is no longer defined by anxiety and fears, but by hope and understanding. This is captured in a series of 3-minute Virtual Reality films. To appreciate exactly what is entailed, he said, you first have to recognise the complexities of the incredibly culturally diverse and generally low socio-economic St Marys community and earn that community’s trust – something David has been working on for several years. People of many backgrounds, including Maltese, Persian, English, Filipino, Irish, Aboriginal and the Pacific Islands, mix in what is a “very dynamic community during the day”. But social cohesion has been affected and the area is “filled with anxiety at night”, particularly for women and Seniors. Through music, art, dance and theatre, the Seniors started talking about their fears regarding lack of employment, losing their history and culture, the environment, impact of the second Sydney airport and their ability to breathe clean air. “Rather than accepting those negatives, we said ‘imagine if you could change that, what would it look like?’” David said. Part of the answer came in people’s traditional songs, finding new words or new places to rework those songs and finding common themes and values between the cultures, while challenging old assumptions. While it’s not “a blunt political tool” turning Seniors into activists, David said both the 18-month project and the resultant films had certainly raised awareness of the need for environmental and cultural sustainability, empathy and understanding. It also challenged the myth that Seniors were passive, accepting, couldn’t look into the future and hated technology. On the last point, David said, when shown what was possible, most Seniors had fully embraced technology. That potentially opened new doors in communication between older and younger generations. David was particularly moved by one group, who when asked a location of particular significance for them to include in the film, replied “here, this community centre, because this is where we met and we’ve made friends here”. “When it comes down to it, it’s really quite basic what people want, and that is love and connection with other people and with the environment,” David said. However, this could be just the start, with David and illuminart seeing VR as “a very powerful tool of the arts”. It is accessible to all ages (over 13) both physically and in terms of communication, using art, music and film, and with the ability to be adapted to different languages, including sign language. There are hopes that similar partnerships could be formed in other health areas, including mental health, trauma and cross-generational work. The only boundary is people’s imagination – something the GeriActivists have shown plenty of. The GeriActivists is a partnership between illuminart, Western Sydney University, Nepean Multicultural Access, St Marys Area Cultural Development Project and Penrith City Council, and funded through The Australia Council and Create NSW. 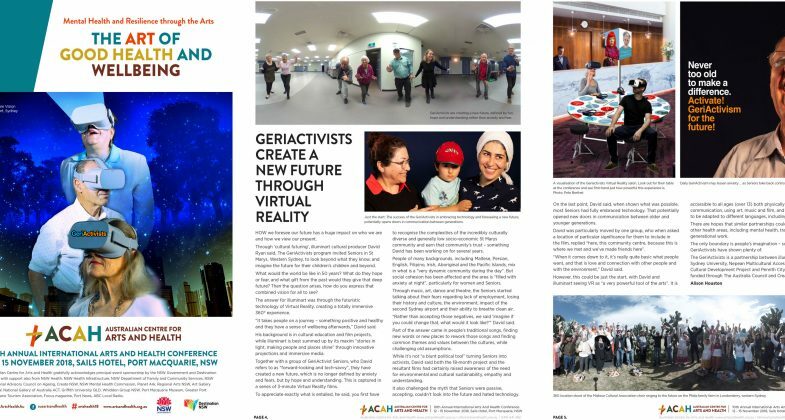 See The GeriActivists: A future vision in Virtual Reality by St Marys elders. The GeriActivists are a bunch of forward looking, tech savvy seniors who imagine what life might be like fifty years from now. They are St Marys locals who are working together with illuminart to help them harness Virtual Reality technology and visualise the future. The GeriActivists VR salon will be on display at Penrith and St Marys Libraries, presenting the stories and imaginings of local seniors who collaborated with illuminart. These extraordinary immersive futures combining creative performances with 3D animations can be experienced in a sitting of 10-15 minutes using the VR headsets provided at the Salon. If you are unable to attend the display, please contact us to find out how you can book the VR Salon or view the films online.